The looks and style you crave along with performance and refinement you only get from a Star Motorcycle. 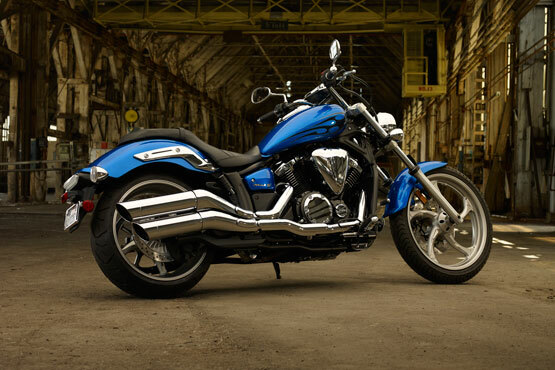 The all new 2011 Yamaha Stryker, a machine designed to be ridden… and admired. Chopper inspired styling, attention to detail and mechanical function blend together in a stunning new mid class “chopper”. One ride and you will know we got it right. The style, the performance and that special attitude is intoxicating. Strykes fear into everything else. The all new 2011 Stryker by Star Motorcycles is the coolest bike to roll off the assembly line since the Yamaha Raider took the industry by storm. With its raked out front end and “fists in the wind” riding position, this bike is pure attitude. And with fuel injection, a 1304cc V-Twin, and a beautiful final belt drive, the 2011 Yamaha Stryker churns out plenty of low-end torque that gets to the ground in a very satisfying way. It’s time for an attitude adjustment! Powered by a liquid-cooled, 1304cc V-twin powerplant, the new Stryker offers an unparalleled riding experience. 1304cc (80 cubic inch), liquid-cooled, short stroke, SOHC, 4-valve per cylinder, fuel injected, 60° V-twin powerplant pumps out impressive power and torque for excellent cruising performance. Liquid-cooling not only allows for higher state of tune because it maintains more stable operating temperatures, but also reduces mechanical noise for a quieter engine. In an effort to maintain the classic air-cooled appearance of the engine, cooling fins have been added as a styling highlight. The short stroke engine design reduces the “height” of the engine, while the 60 degree “V” makes the engine more compact thereby centralizing mass and lowering the center of gravity for lighter, more responsive handling. One-piece cylinder heads feature 4-valves per cylinder to provide optimum breathing efficiency for maximum power output. Stylish chromed cylinder head covers. The SOHC valve train features 36mm intake and 32mm exhaust valves with special single coil springs for great power and torque. Valves angles are set at 20 degrees from centre. Specially designed roller rockers activate the valves. The rocker system allows a greater amount of valve lift without causing excessive camshaft wear and friction. The slipper portion of the rocker arm features a needle bearing which reduces wear and slide resistance (friction). The camshafts have been specially designed for use with roller rockers. Pent roof combustion chamber design and optimized squish area forces the fuel / air mixture toward the centre of the combustion chamber for more complete combustion and hence improved power and cleaner emissions. The radiator is mounted between the front frame down tubes to minimize its appearance especially when viewing the machine from the side. Even the rad hoses have been discreetly placed for a cleaner appearance. An electric fan aids in cooling during very hot weather or in stop and go traffic. Automatic hydraulic cam chain tensioners reduce mechanical noise and simplify maintenance too. Ceramic composite-plated cylinders provide uniform heat dissipation while also reducing friction and weight. The cylinders have a tapered “V” appearance to highlight the V-twin design. Cylinder bore is 100mm. High performance forged pistons offer great durability and reduced weight for faster engine response and less mechanical vibration. Crankshaft features a single crank pin design. This specially designed crank and uneven firing order helps to enhance the pulse feeling and that unique V-twin engine character. Single axis, left and right dual engine counter balancers reduce vibration to a minimum while maximizing rider comfort. Crankcase design features internal oil and coolant lines for a clean, air-cooled engine appearance. There are special piston coolers that spray oil at the under side of the pistons. Easy access, spin on type oil filter is located under the engine. There is no need to remove any parts to access the oil filter. Classic side mounted air box houses a high-flow viscous paper-type filter and adds that special styling touch too. Mikuni dual bore, 40mm throttle body fuel injection system with TPS (Throttle Position Sensor) and ISC (Idle Speed Control). This is a “closed loop” system that utilizes an oxygen sensor in the exhaust. The sensor “sniffs” the spent exhaust gases and feeds back info to the ECU which in turn adjusts the fuel/air mixture for maximum power with minimum emissions. The oxygen sensor is located before the mufflers, so the use of slip-on mufflers will not affect this system. Each injector features 12 holes and a dual spray pattern for better fuel atomization and more complete combustion chamber filling. There is one injector per cylinder. Fuel injection benefits include improved fuel economy; choke less operation, reduced emissions, and smoother running. High pressure fuel pump is located in a separate sub tank below the seat. 2 into 1 into 2 exhaust system features dual slash cut mufflers which provide a specially developed exhaust note that accentuates the V-Twin rumble. The engineers call it the “sound of acceleration”. A 3-way honeycomb catalyzer is located at the entry point to the mufflers. The catalyzer reduces harmful exhaust emissions. Smooth-shifting, 5-speed transmission with 5th gear overdrive delivers outstanding cruising performance and reduced rpms at highway speeds for comfortable cruising. Clean, quiet belt drive system is extremely low maintenance and simplifies customization. The belt features carbon cords for extra strength. Air Induction System (A.I.S.) reduces harmful exhaust emissions (CO + HC). Double cradle steel frame with “open neck space” provides an aggressive chopper image. This frame utilizes a rigid engine mounting system to optimize the overall rigidity balance of the chassis for superior handling. The rake is 34 degrees with a yoke offset * of 6 degrees. The frame not provides excellent handling and roomy ergonomics but also compliments the beautiful flowing lines of the entire machine. Long 1,750mm (68.9″) wheelbase creates a long, low profile and solid, stable handling. This chassis offers a 45% & 55% front to rear weight distribution and is approximately 60mm longer than the standard V-Star 1300. The long low design means spacious ergonomics with lots of leg room, which maximizes rider and passenger comfort. Raked out 41mm front fork offers excellent ride comfort and compliance. Chip protectors help to prevent stone chips in the tubes. Front wheel travel is 135mm (5.3″). Monocross style, spring preload-adjustable, single-shock, link rear suspension centralizes mass for agile handling. The linkage system provides a rising rate effect that provides excellent compliance on both small and large bumps. There are 9 positions of spring preload adjustability to suit rider preference. Rear shock is vertically mounted behind the engine and is tucked out of sight for that classic, clean, hard tail look. Rear wheel travel is 100mm (3.9″). Single, large 320mm, floating front disc is squeezed by a compact twin piston front caliper. 310mm rear disc brake is squeezed by single piston caliper mounted to the underside of the swingarm. This design not only helps to hide the caliper but also lowers the center of gravity for better handling. Newly designed, lightweight 5-spoke cast aluminium wheels are fitted tubeless tires. These stylish wheels are both easy to clean and maintenance-free. The front wheel is a MT3.50 x 21 inch while the rear is a wide MT7.50×18. The narrow front tire (120/70 x 21) and wide rear tire (240/40R18) enhance the chopper styling image. Newly designed 1 inch handlebars are mounted directly to the upper handlebar crown without the use of traditional handlebar holders. This design accentuations the chopper profile while also providing an aggressive riding position. Newly design deep-bend front and rear fenders enhance the chopper styling. Steel material allows for easy customization and painting if desired. 15 litre teardrop shaped fuel tank with chromed filler cap. The long, slim tank design accentuates the bikes muscular styling lines. Newly designed one piece rider and passenger seat offers a low 670mm (26.4″) seat height and great styling too. Seating position is best described as sitting “in” not “on” providing a very special “riding attitude”. Chromed handlebar-mounted instrument features an analog speedometer, digital odometer, dual tripmeters, fuel gauge, fuel reserve tripmeter (counts kilometres since the fuel went on reserve), clock, and a range of warning lights and self diagnostic functions. Instrument functions can be “tabbed” through and re-set using the RHS handlebar switch gear, allowing the operator to change instrument meter functions without taking hands off the bars. Newly designed, compact 60/55 watt high intensity halogen headlight emphasizes the “chopper” image. Eye catching LED tail light is not only very visible but also uses less electrical power than a conventional bulb style taillight. Industry-leading Star family fit and finish features rich, lustrous paint and extensive chrome accents creating a machine as stunning as it is powerful. Extra wide front brake and clutch levers provide a quality feel. Steering lock is integrated into the main ignition switch for extra convenience. Low-maintenance, sealed battery ensures fuss-free, dependable starting. Self-cancelling turn signals feature stylish clear lenses.